Bell peppers are part of the nightshade family of vegetables together with tomatoes and eggplants. Orange or yellow bell peppers are more mature than green bell peppers, and are harvested before they fully mature and turn red. They have a slightly fruity taste and are rich in Vitamins A & C, and Beta Carotene. They contain more vitamin C than oranges. Yellow bell peppers are three- or four-lobed fruits of the capsicum annum species. They are more mild in taste than many peppers, and so are known as sweet peppers. They are mostly hollow, having flesh about 1/4" thick and contain seeds near the stem end, held in place by a thick soft membrane. Colors: Yellow. They can be harvested when unripe, when they are green. Substitutes: Green bell pepper, Orange bell pepper, Red bell pepper, Yellow banana pepper. Choosing: Chose firm peppers with no breaks in the skin. Make sure that the skin is smooth with no wrinkling. Buying: Yellow bell peppers can cost more than their green counterparts. (The green bell peppers are simply harvested when not yet ripe.) Yellow bell peppers are a little sweeter, and are often chosen for their better presentation, but they do contain more nutrients. 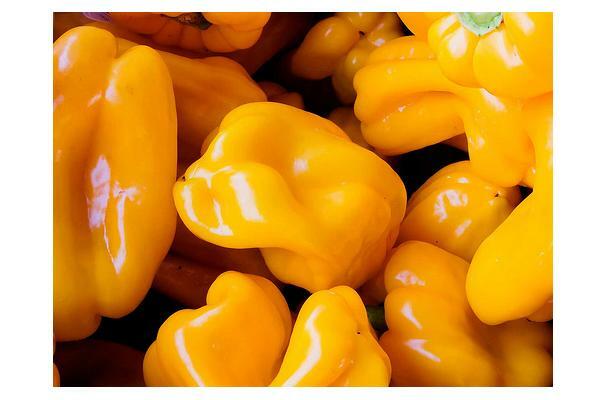 Look for yellow bell peppers at farmers' markets locally. Procuring: Bell peppers are a nightshade, and are very easy to grow. They do well in hot weather, as long as there is enough rainfall. Otherwise, they need to be irrigated. They do not need a long growing season. They will continue to produce until a freeze. You may prefer to cut around the stem and gently pull the seed area out. You may also cut the pepper in half from stem end to blossom end, and scoop out the seeds. The pepper can be sliced or chopped or diced, depending on the recipe. Yellow bell pepper can be eaten raw or cooked. Cleaning: Wash gently. You may prefer to use a citric acid wash, available in your supermarket or grocery store. Yellow bell peppers can be blanched and frozen. This changes the texture somewhat, but they can be enjoyed in various recipes. History: Peppers are native to Central and South America. They were introduced to Europe by Columbus in the 15th century.